Orlando, FL (July 7, 2015): David Weekley Homes, that nation’s largest privately-held home builder, is now open for sales in the Preserve of Oviedo on the Park. Located northeast of Orlando in Oviedo, David Weekley Homes is building 44 alley- and front-load homes, featuring floor plans from its Carriage and Park Series. This family-friendly community in Oviedo, which was named one of the “Top 10 Best Towns for Families” by Family Circle magazine in 2011, offers a variety of two-story homes, ranging in size from 2,000 to 2,900 square feet. Each of David Weekley’s homes will back up to the wetlands, offering scenic views, with homes from the Carriage Series facing the park. Preserve of Oviedo on the Park amenities will include a boat house with paddle boat rentals, splash park, trail system and a large amphitheater in the community. Residents will enjoy easy access to State Road 417, retail shops, coffee houses, bars and restaurants, and a nearby recreation center. 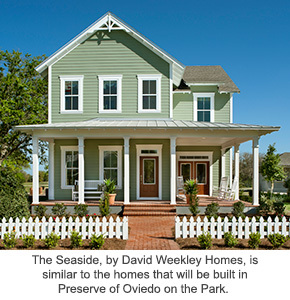 For more information about Preserve of Oviedo on the Park, contact 866-994-3639.